Not all cabbages have the round shape that we usually find on the market, and not all grow to proportions that are big enough to feed a football team. 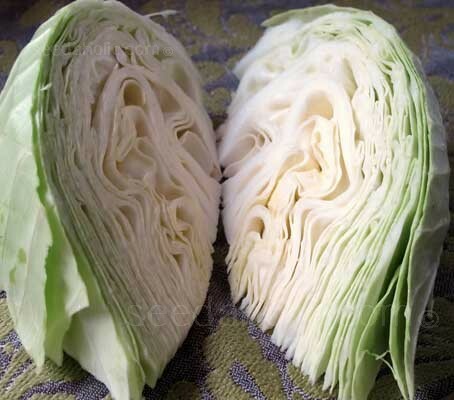 Cabbage ‘Ox Heart’ is a famous European heirloom, Sweetheart type cabbage. An early variety that produces a mid-sized, conical head with large, firm, pointed hearts and ample wrapped leaves of light green and marked veins. This very fine cabbage variety is suitable for a multitude of uses. The white hearts are crisp and sweet, excellent eaten fresh in salads or cooked. Maturing in 65 to 75 days, it can be grown close together, spaced just 30cm (12in) apart and is a great addition to the smaller garden. It can be harvested early for smaller heads or left to grow. They will stand well in the field until needed or can be picked and stored for up to 10 weeks. This seed has been organically produced, verified and certified. It has been harvested from plants that have themselves been raised organically, without the use of artificial pesticides, herbicides and fertilisers. All brassica crops grow best in partial-shade, in firm, fertile, free-draining soil. Start digging over your soil as soon as you can brave the elements. Remove any stones you find and work in plenty of well-rotted manure or compost. Tread on the soil to remove air pockets and to make the surface firm. Brassicas will fail if the soil is too acidic; add lime to the soil if necessary, aiming for a pH of 6.5 to 7.5. Nearly all brassicas should be planted in a seedbed or in modules under glass and then transferred. Seeds should be sown thinly, as this reduces the amount of future thinning necessary and potential risk from pests.Sow seeds 12mm (½in) deep and space 15 to 20cm (6 to 8in) between rows. Once the seeds have germinated, thin the seedlings to 7.5cm (3in) between each plant. After germination, seedlings will often be ‘leggy’, so plant them as deep as possible to really anchor them into the soil. Cabbage seedlings are ready for transplanting when they are between 6 and 8cm high (2½ to 3in). Water the day before moving, and keep well-watered until established. 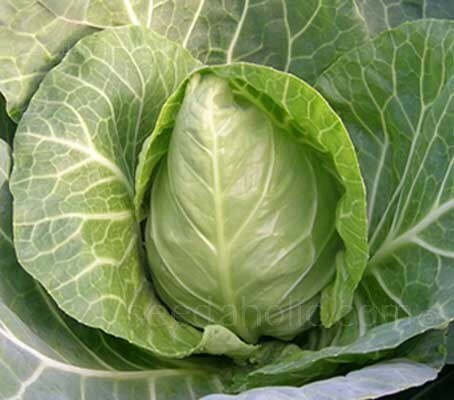 Plant firmly, close together for small heads and wider apart for larger cabbages, around 30 to 45cm (12 to 18in) apart. Cabbage seedlings are ready for transplanting when they are between 6 and 8cm high (2½ to 3in). Water the day before moving, and keep well-watered until established. Plant firmly, close together for small heads and wider apart for larger cabbages, around 30 to 45cm (12 to 18in) apart. Clear away any yellow leaves. Feed the plants as they near maturity with a foliar feed. Earliest heads can be cut, leaving the stump in the ground to produce a second crop of small leafy heads. Brassicas are affected by a wide range of pests and diseases, especially the fungal disease, club root. The roots become stubby and swollen and can develop wet rot, while leaves become yellow and wilt, causing severe stunting of growth. Remove any infected plants from the ground and destroy. Make sure the soil is adequately limed and well drained. Mint: Effective against Cabbage White Butterflies, Aphids / Flea Beetles. Thyme:To ward off that nasty Cabbage Worm. Also useful: Sage, Oregano, Borage, Chamomile and Nasturtium. Bad Companions: Dill, Strawberries, Runner Beans and Tomato. In the wild, the Brassica oleracea plant is native to the Mediterranean region of Europe, and is somewhat similar in appearance to a leafy canola plant. Without detailed knowledge of plant breeding or genetics, simple selection by the people growing the plant over seven thousand years that had the features that they most desired, led to the development of six dramatically different vegetables. Although they appear very different, kale, cabbage, kohlrabi, cauliflower, broccoli and brussels sprouts are all the same species, Brassica oleracea. As time passed, some people began to express a preference for those plants with a tight cluster of tender young leaves in the centre of the plant at the top of the stem. Because of this preference for plants in which there were a large number of tender leaves closely packed into the terminal bud at the top of the stem, these plants were selected and propagated more frequently. A continued favouritism of these plants for hundreds of successive generations resulted in the gradual formation of a more and more dense cluster of leaves at the top of the plant. Eventually, the cluster of leaves became so large, it tended to dominate the whole plant, and the cabbage "head" we know today was born. This progression is thought to have been complete in the 1st century A.D. The Latin name Brassica derives from the Celtic ‘bresic’. The species oleracea refers to a vegetable garden herb that is used in cooking. This type of pointed cabbage goes by various names. In Ireland and the UK it is called a Sweetheart, York or Pointed Cabbage. In France it is referred to as Chou Pointu (pointed cabbage) or Cœur de Bœuf (beef heart) cabbage. In Italy it is called Cavolo Cappuccio (Long hood Cabbage), while in America it is called a Sugarloaf Cabbage. Can be sown year round.